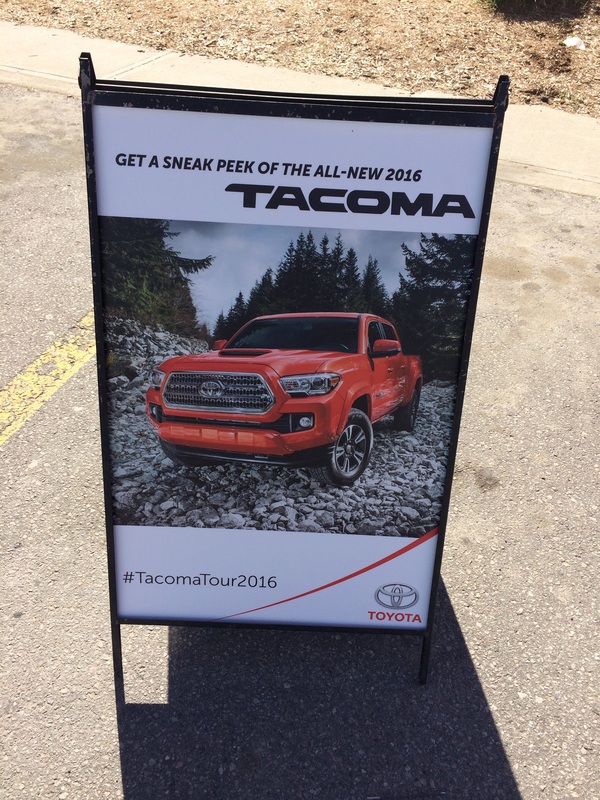 We recently had the opportunity to get a sneak peek at the 2016 Toyota Tacoma at Toyota Canada’s cross-country tour titled #TacomaTour2016. Toyota Canada created the national tour as a way to promote its all new, long-awaited Tacoma truck which is arriving in showrooms this Fall. We recently caught up with the tour at the Vaughn Mills shopping area just north of Toronto. During the event, we had the opportunity to discuss trucks with esteemed truck editor Howard Elmer and he had nothing but good things to say about the new Tacoma. He described how the new Tacoma builds on its rich heritage while taking us through the “ins and the outs” of the new truck. Along the way we also swapped our personal truck stories which was very cool for me as an owner of a 2006 Tacoma. You literally could not miss the new Tacoma as it was painted in Toyota’s new “inferno” orange colour making it stand out dramatically from the other vehicles at the event. Toyota also had a range of other vehicles at the event. We ended up briefly test driving the new 4Runner model as well which was very impressive on first impression. With the Tacoma only seeing minor updates since its last major facelift back in 2006, it was time to update this iconic mid-sized truck. 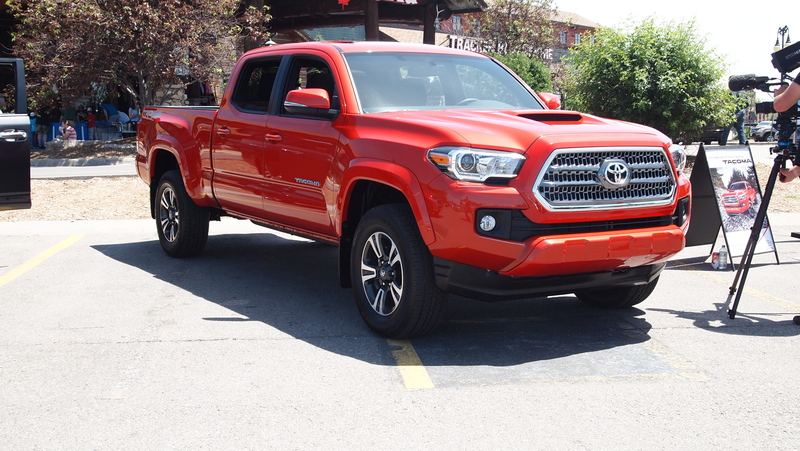 Toyota has delivered on their promise to reinvigorate the Tacoma model with its new design as it boosts angular bold lines with a contoured rugged exterior while also providing an ultra modern, comfortable interior. The demo on hand was the double cab TRD sport model which is near the top end trim level. Unfortunately, it was the only model in Canada so we were not allowed to test it on the road…for obvious reasons! The Tacoma’s exterior has sharper more modern lines with added stamping and a new bold front face. The new interior is sharp and a huge upgrade from the current design. With the addition of all the modern bells and whistles… like wireless charging, bluetooth, sunroof, and a GoPro camera mount, this TRD sport version really does dress up nicely. The seats seem stiffer and a little higher off the floor which should please some people who have complained about the “low ride” style of the old seats. 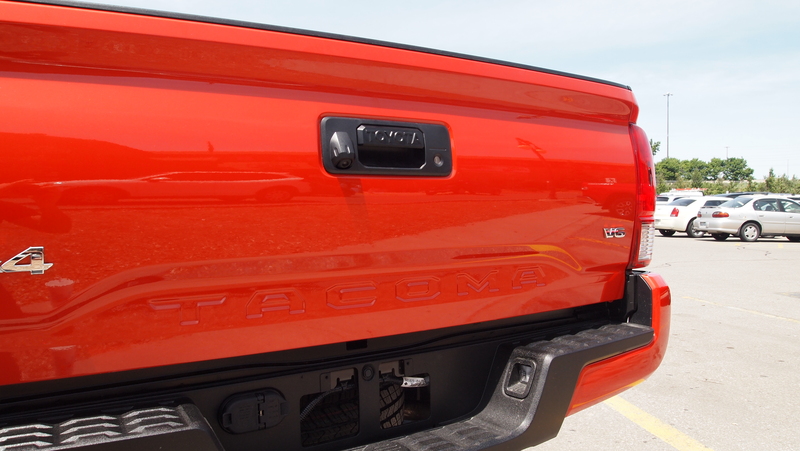 Not only does the new stamped tailgate look rugged it now comes with a much beefier tailgate. The old tailgate was much thinner and very light while the new stronger tailgate has been added to improve its usability for cottage toys such as four-wheelers and heavily stocked coolers. Although beefier overall, the new tailgate is still light to use thanks to a very innovative lift assist system. 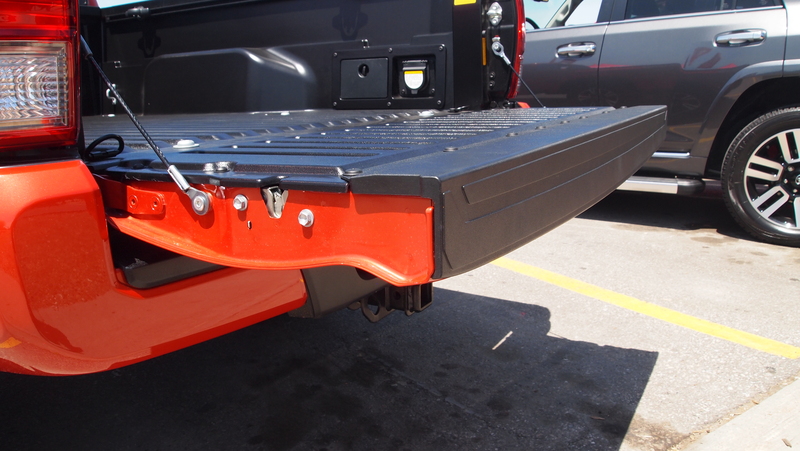 In addition, the new tailgate has a much-needed lock which integrates seamlessly with the factory tri-fold tonneau cover which will surely keep your tools and gear safe in the country as well as the city. The sport model also comes with a slick factory tow hitch. 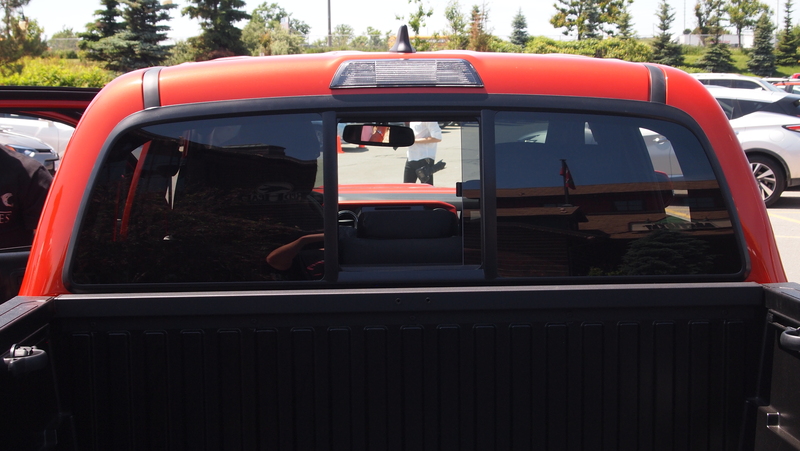 This limited version of the Tacoma also has a bed lamp above the box over the cab access window. This is a great feature to illuminate your truck bed when you need the light most when out camping in the wilderness. As for under the hood: Gone is the old four litre V6, replaced by either a 2.7-liter four-cylinder engine or the brand new 3.5-liter Atkinson V6. The V6 features optimized fuel injection and an Atkinson power cycle (similar to a hybrid) for improved efficiency. This new engine should be one of the winners in today’s V6 fuel economy. A six-speed automatic transmission is available with both engines, while a six-speed manual will be available for the V6 only. Toyota has not announced any power specifications or fuel economy estimates yet. However, if we get 19-20 mpg with our 2006 Tacoma with 225,000 KMs…we’re sure this new model will leave our truck in the dust fuel efficiency wise. Tacoma TRD models will also offer a multi-terrain system that allows the driver to adjust a rotary dial that optimizes various systems for surfaces including mud, sand and rocks. A driver-selectable “crawl mode” also takes care of the throttle and brakes during low-speed maneuvers. A limited-slip differential and locking rear differential will also be available for the 4×4 off-road versions for increased capability on the trail. A rear differential lock is nothing short of a life saver when caught in the thick mud or snow. No official Canadian pricing has been announced, but expect the 2016 Toyota Tacoma to cost roughly the same as the current model when it goes on sale this fall. We are really looking forward to the Tacoma to hit showrooms as it is a much needed addition to the already hot mid-size truck segment which includes the new GMC Canyon and Chevrolet Colorado. The redesigned 2016 Toyota Tacoma should remain a top-pick for buyers looking for a fuel-efficient truck with interior refinements, updated technology while still having the off-road prowess the Tacoma has always been known for.